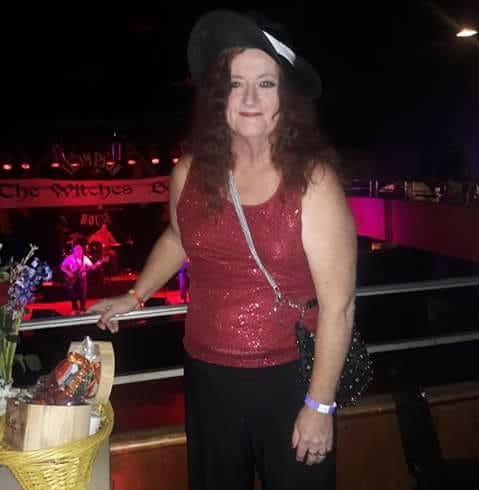 One of the most remarkable moments during the "Witches Ball" on Saturday, came with remembering back to all the Halloween parties which played such an integral part in me beginning to find my way in the world as a transgender woman. Back in those days, my goal was to (of course) do my best to transform from a guy into the most attractive or bizarre woman I could. These days I am taking a much shorter route from trans woman to woman. It's difficult to believe how far I have been able to come in my journey and still have so much fun. I was able to use the rest room as much as I wanted without incident and was even able to enjoy a couple of beers before we cleaned up and headed home after three in the morning. To be able to walk through the crowd and feel all the eyes on me was a rush too. I guess I am just an incurable narcissist after all. I just loved all of the attention and I remembered to ask Liz to take a couple of pictures to illustrate my point. Rarely (never) do I like my pictures but I had a fun time with these.